Losing a child is one of the hardest things that any parent can go through, especially when it happens unexpectedly through sudden infant death syndrome (SIDS). After this happened to Mag and Mike, a few of their friends made the decision to ask for financial support from the couple’s loves ones. 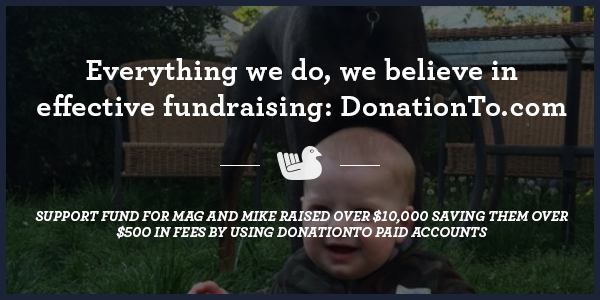 Instead of allocating this particular money toward the lost child’s memory, <a href=”https://www.donationto.com/Support-fund-for-Mag-and-Mike”>this fundraiser</a> asks for financial support to help Mag and Mike do something that will assist them in other ways. For example, enabling them to take more time off of work or take a trip during this difficult period of their lives. DonationTo provides an online fundraising platform that makes it possible to connect with people from around the world. Supporters can donate 24/7 from any web enabled device, and members who choose to set up a paid account will be able to keep 100 percent of every contribution. Everything we do, we believe in effective fundraising. We believe, effective fundraising has no 5% fee & you avoiding credit card fees. We believe, effective fundraising is you keeping 100% all your donations that go straight into your PayPal / WePay account. We believe you should get support from a real person with email & social tool for awareness. Our paid accounts range from $9-24 a month, and they include special features such as unlimited photo uploads, phone support for the family and social networking integration tools. 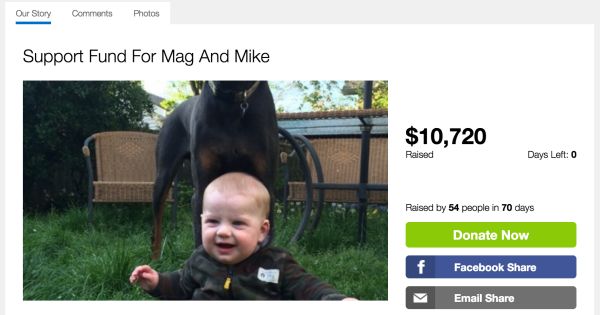 Websites that offer free fundraising often ask for 5 percent of each donation, which would have been $556 of the $11,120 that was donated for Mag and Mike. Having enough understanding and love to ask for contributions without a specific goal assigned to them is unusual, but it really worked in this particular case. Suggested options for the couple include treating themselves to a therapeutic activity, taking additional time off of work and going on a trip to get a change of scenery. However, the couple is truly able to make their own decision about how to use the money that was contributed toward their cause, and this is a great gift indeed. Although this fundraiser is not focused on SIDS, it is impossible not to pay attention to the fact that more awareness is needed of this tragic issue. Approximately 44 percent of all infant deaths in the U.S. are caused by SIDS, and this accounts for 1,500 fatalities every single year. In most cases, it is impossible to know what led to these deaths, and even the best research has only yielded some suggestions for how to provide a safer environment for infants. What we do know is that putting a baby to sleep on their back is the best way to help avoid SIDS. Additionally, it is wise to swaddle a child under the age of one instead of placing any loose blankets in their crib. Some infants are given a pacifier to sleep with, and there is evidence that this reduces the risk of SIDS. Co-sleeping is listed as one of the biggest factors that leads to SIDS, so always place your baby in their crib for bedtime. Other things that you can do to help keep SIDS at bay include avoiding cigarettes during pregnancy and never smoking near the baby after birth, keeping the crib away from any nearby heat sources and ensuring that the mattress is tight-fitting and firm. It is up to every parent and daycare provider to do everything in their power to minimize each child’s SIDS risk. Unfortunately, even if you follow all of these guidelines, it is still possible for SIDS to occur. When these steps are not enough, parents need the understanding and support of their family, friends and local community to help them deal with their tragic and unexpected loss. Money can help people deal with the financial aspects of losing their child, but it cannot do anything for their emotional needs. Therefore, we have tied these two essential components together and made it possible for each contributor to post a supportive comment with their donation. This was actually a very kind way of reaching out because most people truly do want to help but are unaware of how to do so. By asking what she can do, Maria has opened the door for Mag and Mike to get even more support. No amount of money can repair the damage that is caused by losing a young child, but an online fundraiser can provide some much-needed financial stability to a family going through a rough time. DonationTo’s platform also makes it easy for people to reach out with supportive comments. The crowdfunding page for Mag and Mike collected more than $11,000 for the couple, which will give them the ability to take more time off of work to tend to their emotional needs. Fortunately, the fundraising host made the decision to use one of our paid accounts, which saved them more than $500 in fees. The hosts were also able to connect with us for phone support and had the option to upload an unlimited amount of photos. Each donor had the ability to post a nice comment, and they were able to choose between PayPal and WePay as their online payment processing service. Our site is also available worldwide 24/7 and can be accessed from any mobile device. When you put all of these perks together, it is easy to understand why so many people have selected DonationTo as their resource for online fundraising. Everything we do, we believe in effective fundraising. We believe, effective fundraising has no 5% fee & you avoiding credit card fees. We believe, effective fundraising is you keeping 100% all your donations that go straight into your PayPal / WePay account. We believe you should get support from a real person with email & social tool for awareness. Want to create your own fundraising page? Visit DonationTo.com here.